All of the hard work and dedication is about to pay off for our 2012 graduates, as they prepare to cross the stage at The Kimmel Center tonight! 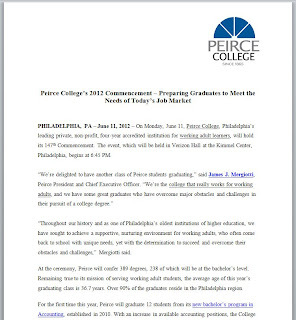 Jump over to the press release we issued today for more details about Peirce Commencement 2012 and a snapshot of some of our featured graduates. This year’s class of graduates exemplifies the hard work, determination, and commitment to education that defines our students. The Class of 2012, many of them working adult learners, has overcome obstacles to pursue their dream of a college degree. One of the many highlights will be the inaugural class of graduates from Peirce’s new Accounting degree program. WURD 900 AM will be broadcasting live from The Kimmel Center tonight and interviewing several Peirce graduates and alumni about their educational journey, so we sure to tune in! We’re excited to continue to share these success stories with the rest of the community, so keep an eye to the blog for more features coming soon. Commencement kicks off at 6:45 p.m. sharp, so be sure to arrive on time! We’ll see you tonight!